the answer is simple and complicated. no, I don’t speak French. yes, I studied French and I know a decent amount of French. the thing is, French is incomprehensible if your accent is off. like, in English, someone can say “what is your name” and even if they have an accent, a deep, deep accent from some place that does not speak English, you will probably know what they’re saying. French is not that way. it’s not as much about the words, as it is about the sounds. 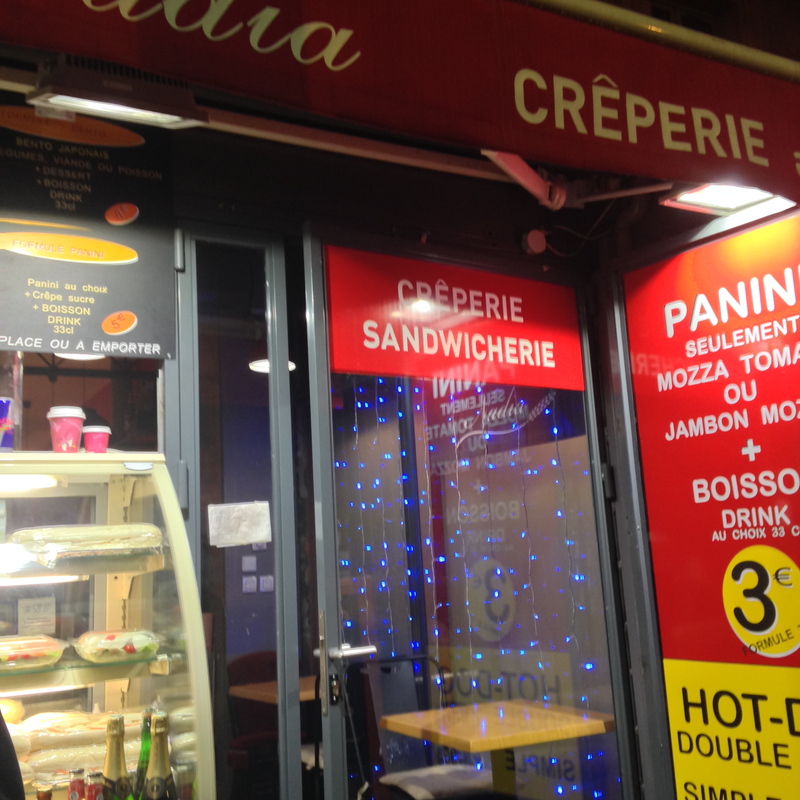 gratuitous shot of a creperie in paris. “crepe” is one of those famously hard to pronounce French words. I decided to switch from studying Spanish (four years in middle/high school) to studying French in college because I knew that I wanted to live in France at some point. unfortunately, my college allowed students to self-select their level of proficiency, which resulted in a lot of immediate to advanced students taking French I for an easy A. needless to say, the classes were fast-paced and the true beginners—just me and a handful of other students that I met over the course of three years—never really learned a lot. 1) Google translate: obviously useful. You can even speak into it or allow someone else to speak into it. And you can hear how words are pronounced, which is infinitely useful. just some of the apps I’m currently employing. 3) Mais Trop! : this is a play on words. “mais trop” doesn’t mean anything in French. (literally, “but very.”) however, it’s pronounced similar to metro, the Parisian transit system. It’s a really cool app that lets you map the most direct way to get somewhere via public transit, so, obvs, indispensable. 4) Metro to US Imperial Converter: today, I tried to bake some salmon. easy peasy, right? wrong. I know how to bake salmon on an American oven using Fahrenheit temperatures. but, how may degrees Celsius should I set the oven in order to have it bake the way I want? same with weighing apples at the grocery store. I normally get one to two pounds of apples, but how many kilograms does that equal? this app is a lifesaver. travelers! expats! what apps do you use to understand a new place? tell me, tell me, tell me! I know this isn’t about an app, but duolingo.com may help. It’s free, and will help at least with picture to spelling memory. But there is nothing better than immersion! Here’s a review of Duolingo by one of my favorite travelers, http://www.fluentin3months.com/duolingo/. This is also a good site for helping you learn the French language faster. Enjoy the journey. I was going to recommend Duolingo as well, and they do have an app you can download. Mango is another great language learning app, but you need a subscription through a library to get it. If you still have a card from your US library check if they have it, or maybe you could borrow a friend’s card. i also have an app that deal strictly with verb training. it gives me a verb and then i must translate it. so maybe something like that might help? not an app, but i carry around a small notebook that i write new words in or questions about a word i heard for later. i find writing it down helps and makes me feel like i’m making progress when i can look back and understand earlier words. i’ve also tried to figure out what i say a lot on english and find the german equivalent. whether it’s something like, “soup is like a hug from the inside” (turns out germans don’t say anything like that and i couldn’t get anyone to translate it for me because they thought it was so weird) or “i’m so hungry i could eat a horse” (ich habe bärenhunger = i have bear hunger). also, it’s small things like knowing how to say, “exactly!” (genau) that i find help me feel a bit more confident. hope that helps! bonne chance! oh, thanks, y’all! I actually start a French language “intensive” next week at a nearby language school, so there’s that, lol. but I did start doing duolingo and it seems super helpful! 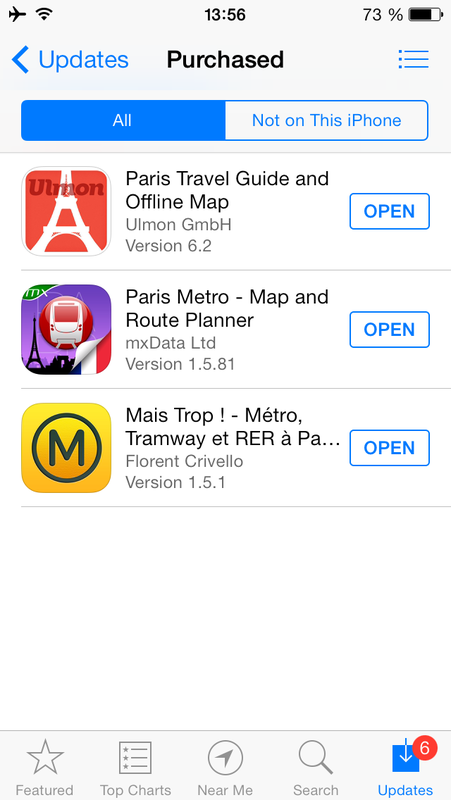 There is an iphone app for RATP that i like. It is pretty routinely updated w/ metro line “disturbances” & arrival times for buses, trams, trains which was great when I wanted to stay indoors as long as possible rather than waiting in the rain. Oh wow! It never even dawned on me that the oven would be different.